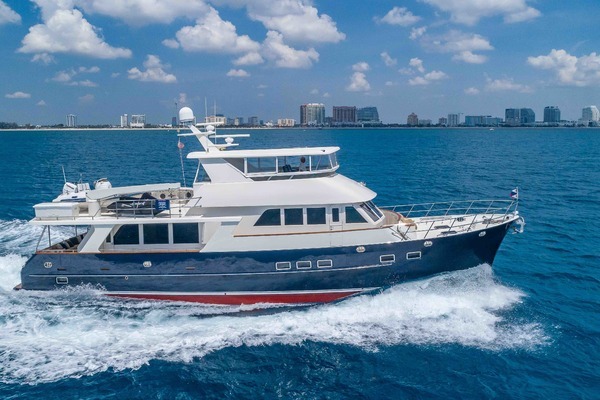 Gracie is the finest example of melding a traditional appearing offshore pilothouse motor yacht with the very best in modern construction methods, equipment and newest generation of technology in the high-performance yachts of today. Built for an experienced yachtsman who wished to be able to relax anywhere in the world, while enjoying watching the racing teams he founded. “Gracie” reflects the modern styling and elegance at the heart of a Marlow Explorer and is a must see. United Yacht Sales New Jersey would love to guide you through a personal showing of this 80' Marlow 80e-cb 2016. This yacht for sale is located in Key Largo, Florida and priced at $4,695,000. For a showing please contact us by filling out the form on this page and we will get back to you shortly! Low profile, seaworthy appearance, high bow, flawless exterior craftsmanship, superb joinery and proper equipment selection are always the initial feelings as you board any Marlow Explorer. Passageways are wide and bulwarks high and safe. Gracie provides all that and then some, as well as a very functional layout and warm, spacious interior. All interior living spaces are teak trimmed, with teak and holly cabin soles, quiet chilled water air-conditioning and reverse cycle heat. The wood is sealed with satin-finish two-part varnishes which only require an occasional wipe down with a dust cloth. The upholstery is Ultra leather or high-end cloth and several layers of variable density foam. The lockers are cedar-lined and lighted. Wherever there is a nook, cranny or unused space, the Marlow factory has found a way to turn it into a locker, drawer or storage bin. No potential storage volume is wasted anywhere aboard this vessel. One boards Gracie from the stern via either stairway from the wide swim platform, or from either side via the forward or aft boarding gates. The integrated swim platform is exceptionally large with protective removable N-rails to assist in boarding from a tender or floating dock. The lazarette, crew quarters and engine room can be accessed by a large hydraulic assisted transom door. There are twin port and starboard stairs to the aft deck leading up to the twin transom doors that grant access to the aft deck. The aft deck is VERY spacious, with cockpit U-shaped bench seating, high gloss aft deck table and room for additional chairs. Adjacent to the salon bulkhead to port of the salon door is a very functional built in stairwell to the fly bridge with a lockable entrance to the crew quarters and engine room. To starboard are the pop down tv, aft deck tethered docking station with full throttle controls (this is a redundant system to the Yacht Controller), icemaker, storage area, fridge and sink. Both spacious side decks run forward from the aft deck to the Portuguese bridge. Optional forward side boarding gates make for multiple boarding options when dock height becomes challenging. Two extra wide salon doors (one hinged and one sliding) create a 5-foot opening into the salon when both doors are open. One enters the salon aft from the aft deck and immediately observes a complete sight line to the forward windshield, as well as the large windows along each side of the salon. To port you immediately see a large and welcoming J shaped settee with internal storage, each section is easily lifted with the assist of a stainless steel pneumatic strut. Additionally, two large and very comfortable salon chairs are free floating for flexible seating options, a large pop up TV is to starboard, ample built in storage can be found throughout salon and a beautiful bar with four stools, storage everywhere, bar sink, icemaker, custom glass ware and bottle storage and TV is forward. Forward to port is a granite topped prep area with Subzero wine cooler and a fridge with an icemaker. There are no long and skinny or short, stocky rooms here, just a feeling of comfort and well laid out proportions. With multiple zones, chilled water loop air-conditioning system you will find no hot spots or cold spots through the boat, just comfortable, quiet air distribution. The elegance, design, styling and well thought out layout need to be seen to be fully appreciated. Up three steps to the large modified U-shaped galley with Seviche colored granite counter tops, stainless steel Franke sink with cutting board cover, Grohe faucets, sink disposal, Dacor smooth glass-top electric range with removable stainless-steel sea rails and pot keepers, Dacor oven, microwave, Three double drawer Sub-Zero refrigerators and freezers (Two in the aft portion of the galley and One extra just forward of the galley), and Fisher-Paykel single-drawer dishwasher. There are abundant cabinets and drawers everywhere one would want. Gourmet cooks will flourish in this wide open well-equipped galley. Forward to the large U-shaped dining area. The 360 degree views allow for a relaxed environment to soak in the beauty of your surroundings. Each large window is double layer tempered glass (laminated with hurricane film for intermediate strengthening to maintain watertight integrity and increase physical security) and provides breathtaking 360-degree visibility. Upon further inspection, you will find an abundance of built in storage just about everywhere you look and a nicely hidden pop down tv to port. The engine room has standing headroom and has been designed to allow very good access to all equipment. Placing fuel tanks forward of the engine room allows the full beam to be used for upgraded equipment placement. Attention to detail enables key maintenance access, which leads to proper adherence to maintenance cycles which yields maximum operational time (rather than being stuck in port for repairs to equipment which had been ignored) and therefore increased resale value. The twin sea chests provide all sea water to the engine room through redundant sea chests that are cross plumbed, a much-improved safety factor over most boats built with ubiquitous inlets wherever it suits the builder with little to no regard to functional serviceability. Commercial and military vessels often use sea chests for the same reasons. Two 32 KW Kohler generators in custom sound boxes provide redundant electrical power at sea (each generator will independently carry the entire vessel electrical load). The dual, redundant and supplementary chilled water chillers and the start/finish of the circulating cold/hot water closed loop are here in the sound insulated machinery area keeping unwelcomed noises from waking guests in the middle of the night. The Naiad stabilizer hydraulics as well as robust hydraulics for the bow and stern thrusters and windlass are located here. On the forward bulkhead is the simplest of fuel management systems. Due to tank location (at the vessels center of gravity), no fuel management is necessary for trim or ballast, allowing all supply and return valves to remain open unless equipment isolation is desired. Fuel levels can be check with the most reliable system available, sight tubes. Aft are the Seatorq oil filled shaft systems for each shaft which greatly reduce friction, increase overall performance and reduce vibration contributing to the Marlow Explorers reputation for a “smooth ride.” Exceptional sound isolation of this compartment and the additional sound isolation provided by two bulkheads and 3900 gallons of fuel tankage as additional insulation, enable normal conversations to take place in the salon and the master stateroom while operating at the 29-knot full speed. Stainless steel engine beds atop carbon fiber stringers support the engines on soft motor mounts that reduce vibrations transmitted to the boat from the engine. The thrust plate absorbs the forward thrust and transmit it smoothly to the hull through the carbon fiber stringers. An upgraded spotzero water maker system with spot free wash down is one of many desirable upgrades selected by the owner and his captain during the build. A separate pump room is located below the forward berthing compartment with access from the companionway. This space contains the fresh water and drinking water filters (to remove particulates, taste and odors) and pumps, redundant water pump and water distribution manifold. The water maker output connects to the separate drinking water and fresh water systems here. 2200 series Dometic Seaxchange XTC Watermaker with Spot Zero water filtration and reverse osmosis system. Upgraded 50 HP full Hydraulic Naiad Bow and Stern thrusters. Each with controls at helm, aft deck, and remote stations. The Command Bridge is conveniently located just a few steps up from the galley and lower dining area. This enclosed bridge is finished in satin teak with high gloss teak and holly decks, Pompanette pilot and copilot helm chairs, large port L-settee (raised for full 360-degree visibility) with an elegant teak table, day head, pop down TV, Four large Garmin touch screen displays, multi zone camera controls, dual ICOM VHF radios and refrigerator with icemaker provide all the creature comforts in this fully air conditioned and heated space. Port and starboard watertight sliding doors allow immediate access to the side decks and when open allow for excellent cross ventilation. The hinged aft watertight door permits easy access to the aft flybridge deck. Large double layer tempered glass windows, provide 360-degree visibility. Overhead dual directional opening hatches with Ocean Aire screens with bug screen and blackout screen allows for additional ventilation when desired. The lighted Marlow proprietary safety and control panel is conveniently located above the windshield. Windshield wipers and washers afford excellent visibility in the worst conditions. The spotlight remote controls and Kahlenberg trumpet horn controls are located within easy reach of the helmsman. The Yacht Controller makes for effortless docking and the multiple redundant systems make this go anywhere Marlow Explorer complete. Immediately aft of the command bridge is the very spacious upper aft deck, with a custom extended hard cabin top overhang forward, L-shaped settee/lounge with built in storage and room for additional teak chairs and table to starboard. To port is the barbecue/prep area with pop down TV, refrigerator with icemaker, sink and large storage lockers. The easy to navigate stairs to the aft deck are also are here. A sliding hatch covers the opening to the aft stairs for additional deck space and added safety while underway. Aft is the fully hydraulic remote controlled 1600-pound telescoping davit and custom stainless-steel dinghy chalks that will accept up to a 16-foot dinghy. The stainless-steel rails on the boat deck have been extended to the end of the boat deck and removable N-rails are installed across the dinghy launching side. Gracie is built using nothing but the best of today’s modern construction materials, taking advantage of all light weight, extremely strong, puncture resistant characteristics to provide a fuel saving at any speed, bullet-proof resistance to punctures, tremendous strength at sea in bad weather conditions and the friendly open feeling of a hull without unnecessary view-interfering bulkheads. The drystack Resin Infusion Vacuum Assisted Transfer (RIVAT) technique saves weight and enhances strength. The Corecell core is engineered for strength, laminating ease and resistance to any water intrusion. The Kevlar inner and outer skins do for this yacht what they do for a policeman, prevent killing penetration. Three major, complex molds are used to build the vessel, minimizing the number of seams and maximizing strength. The primary structure is highly engineered E-Glass and Kevlar in combination with Corecell foam sandwich, laid up with modified epoxy resins. While in the mold for a minimum of 35 days, each hull attains a temperature exceeding 175 degrees, far above that experienced post-delivery. This prevents post-cure problems, often seen as micro-cracking of gel coat and rippling of hulls near bulkheads and other hard spots. Marlow Yachts age gracefully, without the graying of skin or wrinkles normally found in other vessels. The underbody is unique, with twin Velocijet strut keels and mild propeller tunnels. The tunnels permit the propellers to be raised and the thrust along the shafts to be more in line with the forward direction of the vessel. The tunnels improve water flow into the propellers, enhancing thrust. The Velocijet strut keels house and completely protect the shafts and extend below to protect the propellers. They are strong enough to support the boat when out of the water in a boatyard, or during an unfortunate low speed grounding. The Kevlar skin helps protect against severe damage from impact with logs, deadheads and minor and major debris. The hull is finished with Oyster White Awlgrip paint. All false planking lines are crisp and the hull shines. The deck drains and scuppers lead to the continuous drainage system, which runs from bow to stern and prevents water from running down the side of the boat. No black streaks on this beautiful girl. The decks are finished with custom non-skid contrasting surfaces and large waterways carry away any water. Teak decks are provided under the covered aft deck, side decks and also on the centerline of the foredeck where secure footing is so useful in moving to and away from the windlass and anchor gear. The Maxwell anchor windlass is controllable at the bow and at the helm station. A stainless-steel plow and Danforth type anchor are provided. All chain is provided on the primary plow anchor and chain and rode on the secondary anchor. Low profile, heavy duty hatches are provided on the foredeck, above the forward dining area and over the Pilothouse. Custom curved large oval shaped stainless-steel handrails provide safety and security and the quality of the welds displays the artistry from the stainless-steel shop at NORSEMEN Shipyard, the captive Marlow building yard. Moving aft, one walks through the centerline gate in the Portuguese bridge, so substantial that it had to be made in two pieces to permit easy handling. There is built in bow seating with substantial storage volume for fenders, lines and deck gear in the Portuguese bridge. At the front of the cabin on each side are tank fills for Fresh Water, no need to drag a hose across to the other side. Walk aft along either covered, wide side deck and you find a sliding watertight door. Observe the window lands, built with two-inch interior flat surfaces which receive the very strong, laminated, tempered glass from England. Go inside Gracie and notice the clarity of the glass. Continuing aft on either side deck, open the hatch in the cabin side and see the tank fill, off the deck so no contaminants can enter. You can fill the tank from either side without needing to drag the fuel hose across the deck. Notice the drip pocket to catch those last few drops that want to fall on your clean deck. The full beam master stateroom takes great advantage of the warm and open feeling. The king size bed is on centerline with abundant drawer storage and hanging lockers to port and starboard. Also to port is a vanity and to starboard is a well-proportioned seating area with built in storage. Additional storage is located in drawers beneath the bed and in the deck below. Shoji screens to port and starboard permit light to enter the stateroom while providing privacy in marinas. Aft on both sides are light and airy his and hers heads with a very large common shower. Granite counter tops, Grohe fixtures, Vacuflush toilets and custom granite floors with stainless steel grout are but a few of the luxuries in the heads. Full-size GE washer and dryer are located conveniently in the companionway forward of the Master stateroom. The VIP Stateroom will make your family and guests feel extremely welcome. Developed for the owner’s family, this stateroom includes a king-size bed, Two large hanging lockers, Four large drawers and additional lockers. It is light and airy, due to the opening deck hatches with Oceanaire screen and blackout shades. The en-suite oversize head with upgraded Granite floor is also light and airy, with granite counter, large Lexan shower stall with a teak trimmed Lexan shower door, opening port, Vacuflush toilet, Grohe fixtures and large mirror. A separate door to the companionway allows this head to be used as a day head or to be shared with the adjacent starboard guest stateroom. This stateroom provides two single berths with one being oversized, hanging locker and drawer storage. The en-suite guest head with upgraded Granite floor has a large Lexan shower, granite counter and Grohe fixtures. This stateroom is intended for additional overflow sleeping with upper and lower berths and curtain enclosure and Two hanging lockers. When not in use, the curtain is left open, providing more of a spacious feeling. The crew quarters are configured with a Queen sized single berth, lounge area, head with shower, hanging lockers, drawers and bins, refrigerator, microwave, TV and FM and CD radio. Noting that “a happy crew is a happy ship”, the owner has ensured that all furnishings are the same quality as provided in the guest quarters in Gracie. There is plenty of room for the addition of another crew bunk or two if so desired. The lazarette is defined in one world “Cavernous” with room to spare, storage galore with natural lighting, built in Kenmore deep freezer, hydraulic assisted transom door and 4 exterior windows that allow for natural lighting. Marlow has simply hit a homerun with the 80E-CB Gracie. 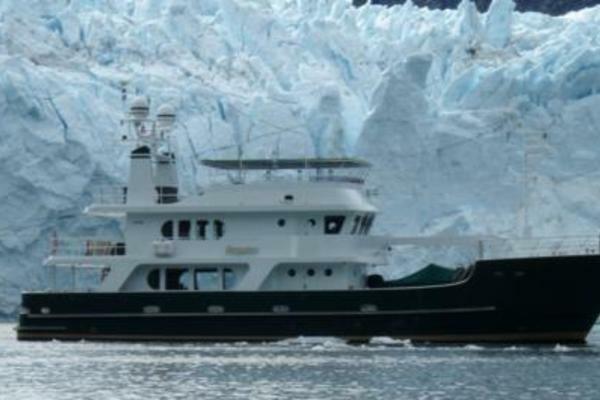 Gracie is now available as the current owner is looking to upgrade to a new Marlow Explorer, making that his Third Marlow to date. She has been meticulously maintained and is ready to go to sea.